A stiffly weeping, slow growing shrub, usually grafted on a standard. The small feathery leaflets give the plant a ferny texture. Foliage is a bright green and the spring flowers are bright yellow. Tolerates drought, poor soil and cold. 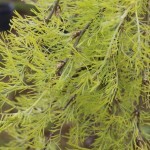 Used as a replacement for Weeping Japanese maples in cold areas, or as a focal point in any garden.